UK – The MOBO (Music Of Black Origin) Awards came of age in October this year when it celebrated its 18th anniversary in style at Glasgow’s brand new 13,000-seater SSE Hydro. Lighting designer Gurdip Mahal, working alongside programmer Ross Williams, bought the M shaped MOBO stage to spectacular life for the BBC3 live broadcast. Not only that, the excited live audience and VIP guests also enjoyed a dazzling light show that saw the set and stage practically dripping with Clay Paky Alpha Beam 700s. This year Radio 1 DJs Trevor Nelson and Sarah-Jane Crawford hosted the Awards. Performing on the night, between Award presentations, were many of today’s top Artists including: Tinie Tempah, Naughty Boy, Iggy Azelea, Laura Mvula, Rudimental and So Solid Crew. 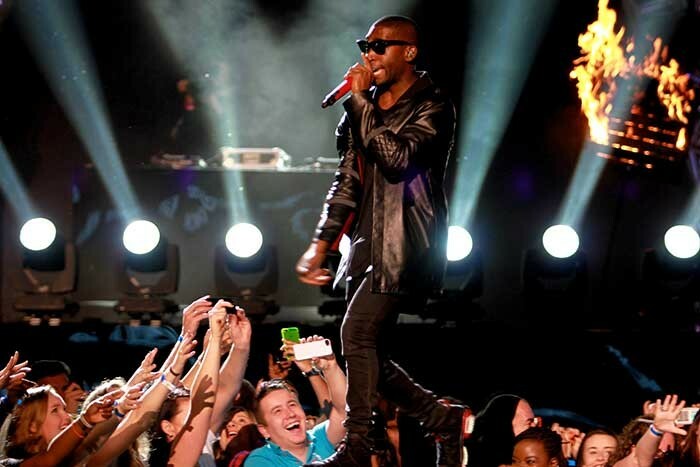 Tinie Tempah set the stage alight, backed by a number of flaming, supersized music stands and 16 x high output Clay Paky Alpha Beam 700s placed in array at floor level. This strategic positioning of the Alpha Beam 700s added razor sharp drama for the live audience and some piercing architectural looks for the TV pictures. All this served to pull the focus right in on Tinie Tempah. The design also bought clever balance to the almost cathedral style M shaped trusses of the set, which were also packed with Alpha Beam 700s. These brilliantly framed-out the truss and gave a sense of dramatic perspective to the stage. The Alpha Beams, supplied by Production Resource Group (PRG), generate a strong, super-concentrated parallel beam and proved ideal for effects like these or for very long-throw projections, as Mahal explains: "The idea was to give the event a high production feel, to make the space seem bigger, more epic. We combined the set and lighting as one and gave the illusion of a wider space by spreading the lighting all around the arena. "I specified the Clay Paky Alpha Beam 700s firstly because of their brightness, this helped deliver the big arena feel we were going for. I also used them because of their precise beam shape and the wide range of colors and effects each fixture offers." Ross Williams took care of the production’s lighting control he explains: "It’s always hard to strike a balance between live event and televised event lighting, which are not always necessarily complementary disciplines. The challenge is to convey the excitement and atmosphere experienced by the live audience to those watching at home, but without ruining the live experience. Without an endless budget all the show’s fixtures had to work hard at doubling up their functions. The versatility of the Alpha Beam 700s proved as effective as ever - they provided the exciting variety of looks we relied so heavily upon." Williams used a Hog 4 and Full Boar 4, while Ges Smith took care of conventional fixtures on two Avolites Pearls. Crew chief for PRG, Gordon Torrington comments: "LDs really like the Alpha beam 700s. They are the original beam light and they offer a large output lens. The Sharpy is excellent, however for a project like this the relatively small lens would look a little lost on the M shaped trusses, especially with the fire effects we had going off around it. The Alpha beam 700 was the perfect option for the big bold backlight, especially against the large truss set."